It has been said that the Longhorn was the meat, milk and transportation for a great part of the Southwest during the embryonic stages of settling the country. In East Texas, from the beginning of the lumbering days until about 1940, many people worked these noble beasts during the days of the week, then rode them to town on Saturday and to church on Sunday. In the early 1800's, a relative of mine assembled a wagon train in Austin, Tex., to go to California For the sake of the safety in numbers, he specified that there be 200 wagons in the train. 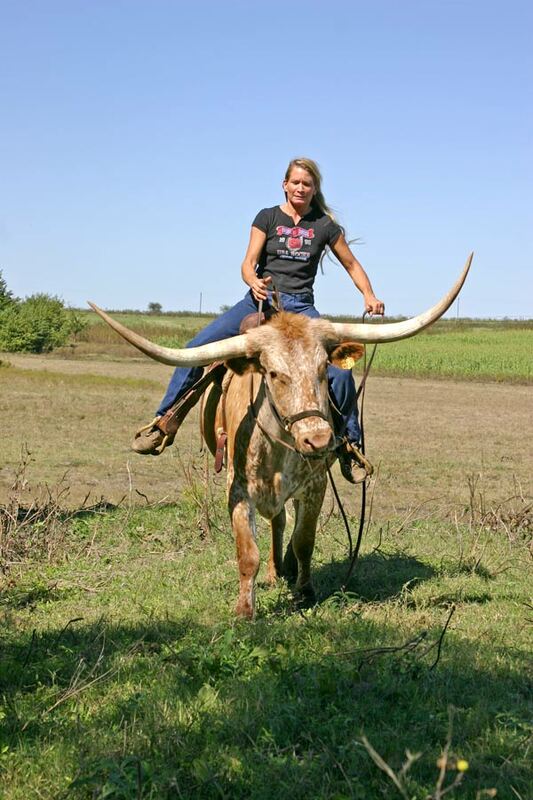 All animals on the train were to be Longhorn oxen, including the riding animals. No mules or horses were allowed. You can eat the oxen when necessary. They are less fractious than horses and mules. They travel better on the desert sand with their split hooves and in the bogs of the river they will keep going when there won't even be a bubble to indicate where a horse and rider have been. You can make rawhide from the oxen but not the horse. They can travel longer distances between water holes. To make a long story short, all of the wagons made it to California and all were pulled by oxen. With this background knowledge of the Longhorn's many transportation uses. 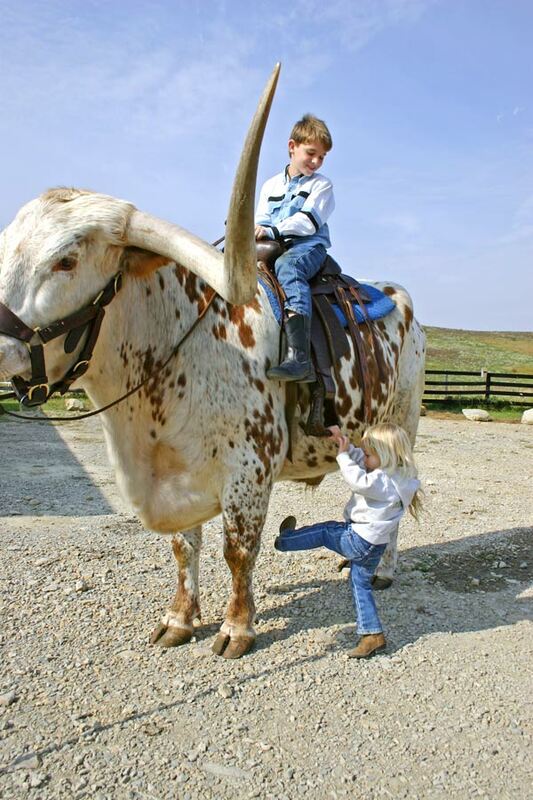 It seems less a freak novelty to break the Longhorn to saddle than it would first appear. One could ask the question. "Does it make less sense to break the Longhorn than the horse?" I have talked at length with a man who bulldogs and ropes off his Longhorn steer. 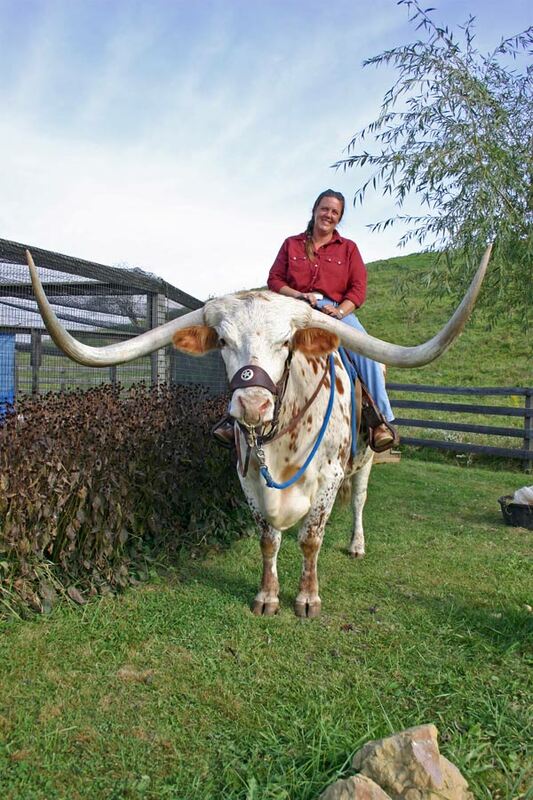 Okay, now... how do you train a Longhorn to be a saddle animal? First, much of the training used to make draft animals is applicable to the early training of any saddle animal. I like to start with an animal that is good-natured. There are simply too many good-natured steers out there to fool with one that is fractious or unpredictable. It is desirable to start with an animal that was halter broken at less than a year old. As I said, this is helpful, but not critical. As Travis Marks once told me, the gentle disposition is much more important than the age of a prospective saddle steer. Also, when starting with an older animal, one can immediately start the entire training process, whereas with a younger animal, you have to wait until it gets enough size and maturity to carry a saddle and rider. To start, put a halter on the steer. Having him squeezed in a chute makes it easy. Then I simply take up the slack, tie him off with about two feet of lead rope and leave him for about a week. I provide water free choice, but each bite he gets for that week he takes from me. He will soon be trying to walk to me when I approach him with sweet feed or cottonseed cubes. About this time. I start scratching the steer between the horns and over the poll then I start approaching the steer from the side It takes a while for a steer to gain confidence that you are not going to hurt him. To keep from getting kicked, I will put up a portable panel on the side that I want to approach. I start brushing him with a special brush that I make. It consists of a stiff bristle brush with a four-foot -handle screwed to the back of it. This allows me to brush the animal without the risk of getting kicked. (Some of those jokers can kick a bull's eye through a knot hole) It doesn't take long before the steer starts to enjoy the brushing. Now I untie him from the loop and start trying to lead him. He should give to the pressure on the halter, sometimes hesitantly, but will soon learn what Is expected of him. Each time he does well, I reward him with a cube. It Is critical at this stage that the trainer not lose his cool. A good whack between the horns with the end of a lead rope will set him back, and it could take as long as a couple of months to regain his confidence. At this point. I do nothing but lead him around the corral and then the pasture, teaching him to respond to the lead rope, He should be advanced enough by now not to try to bolt or go his own way. When I turn him back into the corral, I let him drag the lead rope. As he walks and steps on the lead rope, he is helping to train himself to give In to pressure on the halter. Now I work him into a narrow chute or between two portable panels and ease a saddle blanket and saddle on him. The reaction of each steer is unpredictable, Some of them come unglued and some don't even get walleyed. Whatever happens, the saddle should be put on and cinched up. (Not very tight, because bovines can't take a cinch as tight as a horse can.) Then I take him around the corral and pet, scratch, and feed him until he settles down. I leave the saddle on just long enough to accomplish this, then I take it off. I saddle him each day, leaving the saddle on a little longer each time. He soon will accept the saddle. Then I like to put a 50-pound bag of feed In each of two burlap bags, drape these sacks over the saddle and lead him around, getting him accustomed to the weight. Next, In preparation for riding the steer. I put brass or chrome knobs on the tip of his horns. After a few saddlings in the narrow alley. I will quietly slip off the top rail into the saddle. My next move depends upon the reaction of the steer to my weight and the movement in the saddle. If he remains quiet I will move around, putting weight in first one stirrup then the other. Then I'll flop my stirrup leathers around to get him accustomed to this unnatural happening. Of course at this point I will pet and scratch him. When I get off. I'll reward him with the usual and expected cube. After a few experiences like this. I'm ready to have someone lead him around while I'm in the saddle. I have the person leading the steer make very deliberate moves. When he makes a right turn, I signal a right turn by shifting my weight slightly to the right . and "plow-lining" him to the right with the reins. Then I clearly say "whoa" and pull back on the reins. The man on the lead rope simultaneously stops. I never cease to be amazed at how quickly the steers learn the "whoa" command. It usually only takes a couple of times with someone leading the steer before he is ready to be ridden "solo." I simply ride him a few minutes In the corral to determine that he is going to behave, and refresh his comprehension of the commands that have been learned. Now I'm ready to ride him in the pasture. I like to get him Into the pasture as soon as possible since this type of riding seems more reasonable and the cues have a reason for being given. I like to get on a cow trail and signal him to follow the twists and turns in the trail This does not bore the steer as quickly as arena riding does. I'll ride him around trees and brush, being very deliberate with the cues and reins. I also like to ride him up hills and across creeks and canyons. The kinds of terrain that these animals can negotiate so surefootedly are downright frightening to look at and think about going over. At this point, it is a matter of putting time and miles on the steer. I start to signaling him to neck rein while I plow line him. He will soon pick up on this, and contrary to some reports, steers can be taught to rein. I've also had some "authorities" tell me that a steer can't be taught to run. This simply is not true. Of the two steers that I am now riding, one will go from stop to a full gallop on command. The type of bridle and bit that should be used depends on personal preference. I have used several different systems and each has its own merit. In one case, I put a ring in the steer's nose and simply snap a rein into each side when I'm ready to ride. Most recently I've started using a racing snaffle bit. This Is the kind that has a "D" ring on each side and does not pull into the mouth as easily as does the kind with an "0" ring. The steers soon begin to look forward to our rides. We now have one in training that simply does not want to come back to the barn and we have to use spurs on him to bring him in from the pasture. This is true only when the steers are penned separately. They are extremely gregarious and this buddy-buddy attitude makes it difficult to ride or sometimes even to lead a steer away from his buddies sat the barn. Consequently. I pen the steers away from each other when I've got one in intensive training. This helps to foster an allegiance to the trainer and cuts down on the amount of roustling necessary to get a steer to accept a new lesson or to leave the corral. Some steers take longer In certain stages than do others. I have a three-year-old that, one week after I put the first halter on him, I put the saddle on him. He accepted the saddle with such calm that I rode him that same day. Five saddlings and eight days later. I rode him around a crowd of nearly one thousand people at the Republican Governor's Kick-Off Race without one miscue on his part. I gave kids, senators and old men rides. Needless to say, I was sure enough proud of "Ol' Red" that day. Well, now you might ask. "What am I going to do with this steer now that I've got him broken?" To quote Travis Marks again. "You can be mounted on the best of horses In a silver-mounted saddle, but you are still just another horseman. 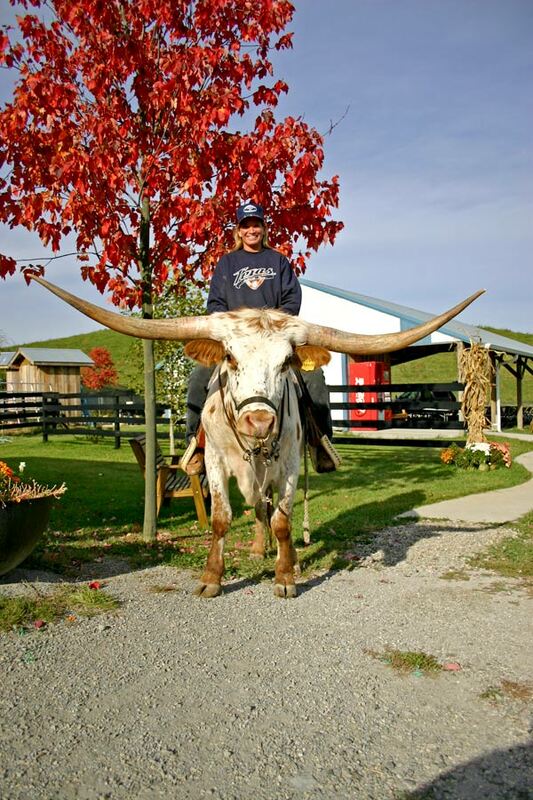 When you are on the back of a steer, that Is a real novelty to most people." Travis' opinion on the matter carries a great deal of authority. He and his riding steer "Ranger" have made more appearances in the Astrodome In Houston than any other celebrity. Recently I took two of the trained steers to Austin, where we met Bill Minter With his steer and sesquicentennial covered wagon. Riding the three steers at point and blank of the wagon, we won the Mayor's Award as the best non-motorized float. This was the largest parade ever, with hundreds of bands, bagpipes, and clanking cavalry. The steers behaved as if they did such things every day of their lives. They were easily the most popular portion of the parade which terminated at the capitol building. By popular demand, we posed the steers on the lawn With the capitol building In the background for a picture-taking session. Now you have the reasons for and the know-how to break those steers. Go ahead... get "Ol' Blue" up, scrape some of the moss off his horns, get the cockleburs out of his hide, and get started. You'll find it to be very rewarding. Interesting and satisfying.